1. Heaven is Here by Stephanie Nielson (of Nie Nie Dialogues) — This is one of the best books I've read. Ever. The thing that touched me the most is her incredibly beautiful relationship with her husband. If you ever want to witness true love, that is it, folks. Reading about their lives before and after the tragic plane crash that changed the path of their lives truly opened my heart and eyes in so many ways. I also love that Stephanie wrote about how being a mother was her greatest ambition, which I totally get (and admire, consider it isn't something that seems to be embraced or celebrated enough in our culture these days). 2. Babel, Mumford and Sons — This album sings to my soul. I can't tell you enough. I wish I could tell you my favorite track, but it's impossible to choose one. So, you'll just have to listen yourself and then come tell me how it has made your life complete. 3. Garnier BB Cream — I wasn't sure I'd want to buy into the hype over BB creams, but after a couple people recommended trying this specific brand (and I had a coupon) I figured I'd give it a try! My verdict? It's pretty fantastic. It evens out my skin tone beautifully, and I find that when I use it, I only have to use a tiny amount of my powder foundation when I apply my makeup, which is definitely a perk. (However, I have noticed I need to apply powder a bit more often than usual throughout the day.) My only question about these "BB creams" is: WHAT ARE THEY? The label on mine (although it is marketed as some sort of skin renewal/complexion perfecter) lists that it is only a tinted moisturizer/sunscreen. So…perhaps this is all one placebo effect? A marketing scheme? If so, they got me. 4. She Reads Truth — I have been doing devotions through this community since they first started earlier this year. 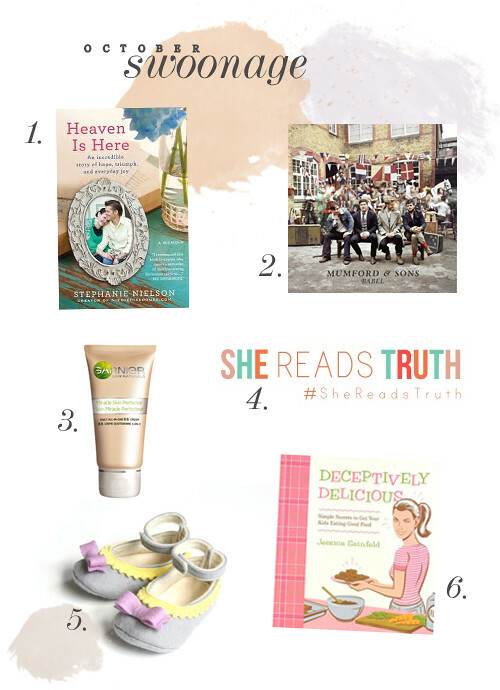 She Reads Truth was created to encourage women to read the bible every day. And you know what? It is definitely amazing how much lighter I feel when I take the time for this morning ritual. I've been slow with each study (I always manage to miss too many days here and there to keep up with the group) but even though I've done them by myself, and at my own pace, it has been a welcome addition to my life. I follow the devotions on my iPod each day, which is such a convenience. I have yet to really participate in discussions on the blog, but I love know it's there for extra encouragement. 5. Hilary Frazier's etsy shop — I'm all kinds of obsessed with the wool shoes she creates. Seriously. She also offers headbands, fingerless gloves, boot cuffs, headbands, and other beautiful things. You must visit her adorable shop! 6. Deceptively Delicious by Jessica Seinfeld — I have jars upon jars of baby food that Eisley no longer eats, and I was thrilled when my mom gave me this book to help use them! Every recipe has some sort of fruit or veggie puree mixed in. It's meant to sneak extra servings of healthy foods into your child's meals, but it is also a simple way for me to use pureed baby food (mostly sweet potato, squash, applesauce, and banana) in things I can make for Eisley to eat. My favorite is sweet potato mixed with cheddar for an incredible grilled cheese sandwich. (I may have eaten more than my share. Don't judge me.) The pancakes with cinnamon and sweet potato are amazing, too, and taste fantastic even without syrup—which make them the perfect toddler breakfast, if you ask me. Is there anything making you swoon this month that you'd like to share? I read Heaven is Here this month too. Fantastic book that should come with a box of kleenex. The Garnier BB Cream (and pretty much all the American BB Creams) are glorified tinted moisturizers. The original Asian BB Creams actually do offer a number of skin perfecting benefits/skincare, sunscreen, and a lot more coverage than the American BB Creams. Ah, I see! Thanks for the info, Amy. This whole BB fad has really confused me. Since the Garnier one does nothing to technically "improve" skin, I'm not sure how they're able to market it that way. I mean, I'm just happy with it as a tinted moisturizer, so I'm unsure why they have to call it a "miracle skin perfecter". Marketing, man. So misleading. Love these kinds of posts. :) Now I need to know how you made that graphic! Amen, sister! I've never used tinted moisturizer of any sort before now, and now I may be hooked. I have read 'Heaven is Here'. I loved it. I was thinking about that book the other day. There are so many books I've read that I have yet to buy. This is one of them. I'm not sure if I could read a book like Heaven Is Here in my seemingly permanent emotional state. It sounds good though! I haven't listened to new music in forever, but I've hear about Mumford & Sons a bunch so perhaps I should give them a try! My husband got me Deceptively Delicious awhile ago & I never considered using baby food! Great idea. I really like BB cream. Moisturizer + sunscreen + coverage in one product is definitely my jam. I have used tinted moisturizer before (Aveeno) but I like BB cream way better. I need to check out Babel. Taylor Swift's new album has been in pretty high rotation around here!